I have been making Pad Thai for years, ever since my parents had a Thai exchange student living at our house years ago when I was in college. 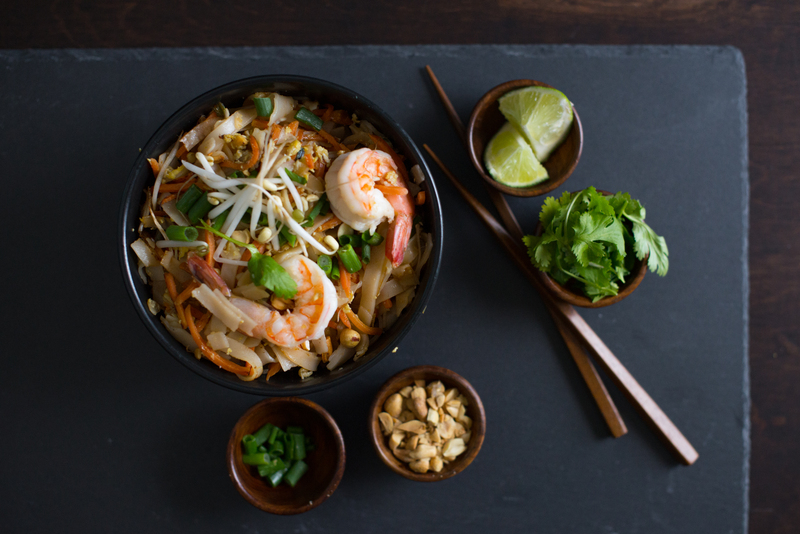 Pad Thai, a popular traditional rice noodle dish is very mild, pleasant and kid-friendly and can be a great starting point into Thai flavors. The more traditional Pad Thai is made with tamarind, but this recipe uses ketchup which is much easier to find. The taste is very similar. Pad Thai, and many other Thai dishes use fish sauce, which can be found in many grocery stores in the international aisles. Fish sauce is a smelly, salty sauce made with fermented fish. If you take a whiff it’s quite stinky, but it’s the backbone of many Southeast Asian dishes and makes them delicious. The rice noodles can be found in international food stores, but I have noticed them showing up in the regular grocery store international aisles. They usually come in a 16 ounce bag. This recipe uses half a bag. For a larger crowd the recipe can be doubled, but it’s most easily made in two batches. If your family does not like shrimp, you can substitute one chicken breast cut into thin bite-sized pieces (a combination of shrimp and chicken is nice, too). For vegetarians, tofu can also be used as a substitute and there is also a vegetarian fish sauce (especially good for those with a fish allergy). Place rice noodles in a bowl of hot water at least 10 minutes to soften. Whisk ketchup, fish sauce, sugar, and chili powder in a small bowl and set aside. Heat a wok with oil on medium high. Cook garlic until softened about 1-2 minutes, being careful not to burn. Add shrimp, chicken or tofu, cooking 4-5 minutes until cooked through. Add fish sauce mixture and cook until boiling. Drain noodles and add to boiling sauce. Turn noodles over making sure all of the noodles cook in the sauce. Lift one side of the noodles off the pan and crack the egg into the wok (egg can be omitted for vegan or egg-free option). Cover the egg with the noodles and let it cook about 1 minute. Toss noodles and egg, letting the egg scramble and combine with the noodles and meat. Add bean sprouts, carrots, green onions and peanuts (remember to reserve tablespoon of each to garnish). Continue to toss noodles and allow the sprouts and carrots to soften. When noodles are soft, remove from wok and place on serving dish or bowl. Sprinkle with remaining fresh beansprouts, carrots, green onions, peanuts and cilantro. Serve hot.